Place the game board in the play area. Use the standard game board, which has a gold-rather than blue-border. The other side of the board (which has a blue border) is used for the advanced game. Place a temple tile on each of the ten board spaces marked by a winged beast (called a "Shedu"). Then, place a treasure token on top of each temple. Put all of the remaining civilization tiles into the bag and shuffle them together. 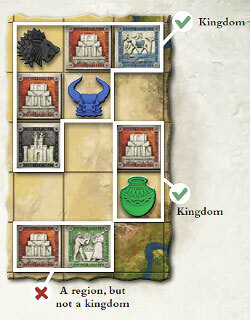 Then, place the four unused treasure tokens back into the box and all monuments near the side of the board. Finally, divide all of the victory point tokens by color and place them by the board. Each player chooses a dynasty consisting of four leaders. The four leaders should bear the same dynastic symbol (i.e., the archer, the bull, the pot, or the lion) in a different color. Each player then takes the unification tile and two catastrophe tiles that contain his dynastic symbol, along with the screen bearing his dynastic symbol. Note: Players are identified by their symbols, not by colors. Everyone uses all four colors. Then, each player draws six tiles from the bag. He places the tiles behind his screen so that only he can see them. He leaves his leaders, his catastrophe tiles, and his unification tile in front of him and in full view of the other players. 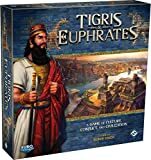 Put the spare leaders, screens, unification tiles, and catastrophe tiles back into the game box. Choose a starting player at random by placing all of the players' unification tiles with the dynastic symbols facedown on the table, mixing them, and then picking one. Play will proceed in a clockwise order. The goal of each player is to develop all four of the key spheres of civilization: settlements, temples, farms, and markets. 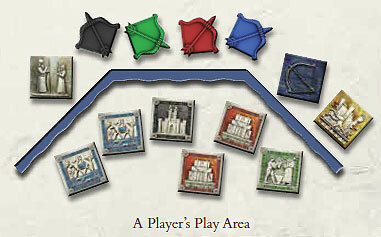 To do this, players will position their leaders, create and extend kingdoms, build monuments, and resolve conflicts. They will thus gain victory points in each of the four spheres. At the end of the game, players compare their lowest spheres; the winner is the player with most victory points in their lowest sphere. 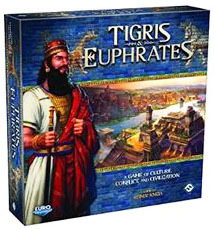 Players will build, unite, and destroy kingdoms during the course of the game. They are fundamental tools in the development of everyone's civilizations. 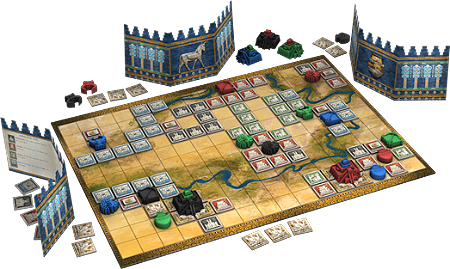 A region is any area on the game board covered by a lone tile (e.g., a temple) or two or more linked tiles. Regions do not contain leaders. At the start of the game there are ten distinct, one-tile regions. Tiles and leaders with a common edge are adjacent. Tiles or leaders are linked if they are adjacent or if they are connected through a chain of adjacent tiles and leaders. A group of one or more linked tiles and at least one leader together is called a kingdom. A kingdom can contain several leaders. It does not matter whether they belong to the same player or different players. Kingdoms grow when leaders and tiles are added to the board. Kingdoms can be united and separated. As long as a kingdom contains only leaders of different colors, everything is peaceful. Conflicts arise when there are two like-colored leaders within one kingdom. The player taking his turn is called the active player. During his turn, the active player may resolve up to two actions in any order. After his turn is complete, the player sitting to his left becomes the active player. There are four different actions an active player can resolve. The two actions that players will resolve most often are positioning leaders and placing tiles. Through these two actions players will build kingdoms and gain victory points. Additionally, players are allowed to replace tiles from their hands and, twice per game, they can alter the game board by playing a catastrophe tile. Below is a list of the possible actions the active player may resolve during his turn. The active player may choose two different actions or the same action twice. Position (place, move, or withdraw) a leader. Replace up to six tiles from his hand. 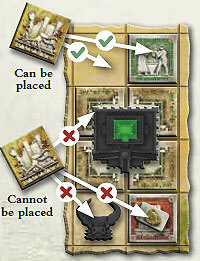 After a tile is placed, a few other events may occur: conflicts, monument building, or treasure distribution. These events are explained in detail later, and the action during which they occur is not finished until the event is resolved. Each player possesses a dynasty of four leaders: a king, a priest, a farmer, and a trader. A player may only position his own leaders. A leader can either come from outside the board or be repositioned from another space on the board. A leader must be placed on an empty space. A leader can only be placed adjacent to a temple (i.e., the leader and temple must have a common edge). A leader cannot be placed in such a way as to unite kingdoms. A leader cannot be placed on a river space. In certain situations, tiles can be removed from the board or turned facedown. When the last temple adjacent to a given leader is removed or turned facedown, the leader is returned to the player of that dynasty. No victory points are gained for the positioning of leaders. A player cannot gain victory points without first having at least one leader on the board. A tile must be placed faceup on an empty space. Farms can only be placed on river spaces. Settlements, temples, and markets cannot be placed on river spaces. A tile cannot be placed where it would unite more than two kingdoms. When placing a tile, it can be placed adjacent to another tile, leader, or in isolation (i.e., adjacent to nothing). After a tile is placed, it cannot be relocated. Most of the time, a player will gain a victory point when a tile is placed. The victory point is always the same color as the placed tile. If the tile is placed in a kingdom, and this kingdom contains a leader of the same color, then the victory point is gained by the player controlling that leader. If there is no leader of the respective color, but there is a king within the kingdom, then the victory point is gained by the player controlling the king. the tile is placed so that it unites two kingdoms, even if there are no conflicts. Victory points are gained immediately when a tile is placed. They are kept hidden behind the players' screens. When a player gains a victory point, he always takes a token valued at "1". At any point during his turn, a player may exchange five tokens valued at "1" for one token valued at "5". At the beginning of the game, each player receives two catastrophe tiles. A player can use them to permanently occupy and negate spaces on the board. When played, the catastrophe tile remains on the board for the rest of the game. It creates a blocked space that cannot be used again. 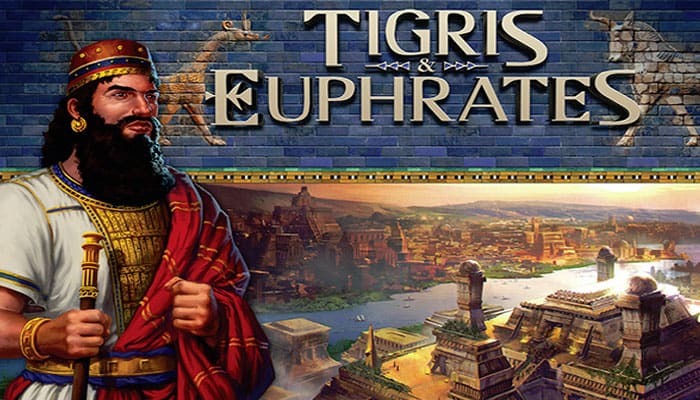 A catastrophe tile cannot be played on a tile bearing a treasure or a monument. A catastrophe tile cannot be played on a leader. A catastrophe tile disrupts the connection between leaders or tiles. In this way, a catastrophe tile may divide a kingdom into two or more parts. 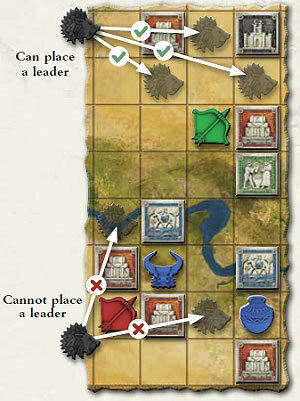 If a catastrophe tile destroys the last temple adjacent to a leader, that leader is immediately withdrawn from the board and returned to the player. A player may take up to six tiles from his hand and return them to the box facedown. Then, he refreshes by drawing the same number of tiles from the bag and adding them to his hand. Discarded tiles are permanently removed from the game. If a player replaces tiles as his first action, he can use the new tiles to carry out his second action. A player's turn ends after he carries out his two actions (or if he chooses to end his turn before taking both available actions). If one or more of his leaders are linked with monuments, he may gain additional victory points. Finally, he refreshes his hand of tiles by drawing from the bag so that he ends his turn with six tiles in his hand. If other players have fewer than six tiles at this point, then they also refresh their hand of tiles. Then, it is the next player's turn. Treasure distribution can be initiated when a player positions a leader or places a tile. At the beginning of the game, ten treasure tokens are placed on the first ten temples on the board. If a kingdom contains more than one treasure at the end of a player's action, the trader in that kingdom must gain all but one of these treasures. If there are treasures on a special border space, the player must take treasures from those spaces first; after that, he may choose from which space to take his remaining treasures. If there is no trader in the kingdom, the treasures remain there until the kingdom has a trader. 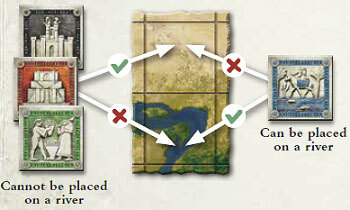 Example 4: The Lion player places the farm tile. First, the Bull player receives a crop. Then, the Lion player takes the upper treasure because the trader in the kingdom belongs to him. He has to choose this treasure because it is on a space with a special border. A player who is attempting to draw a tile is unable to because the bag is empty. At this point all players lower their screens. Each player determines in which sphere they possess the fewest number of victory points, with each player freely allocating his treasures to any sphere(s). The player whose lowest sphere has the highest number of victory points is the winner. In the case of a tie, the tied players compare their second lowest spheres, and so on. If multiple tied players are evenly matched in all four spheres, those players share the victory.